The annual Stewardship Science Academic Programs (SSAP) Symposium took place in North Bethesda, MD from February 19-20, 2014. Individual grant recipients and center directors from the three divisions of the program (High Energy Density Physics, Low Energy Nuclear Science, and Materials Properties Under Extreme Conditions) gave updates on center or group activities and progress. The symposium was opened with a welcome address from Keith LeChien, the Program Manager in the Defense Science Division at the NNSA. Bruce Held, Acting Administrator (NNSA) and Acting Undersecretary for Nuclear Security (DOE), gave the keynote talk before the poster session. 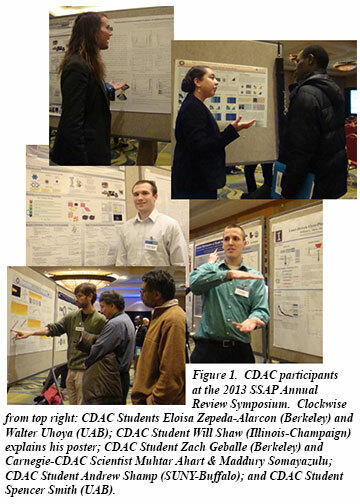 CDAC students and scientists presented 18 posters during the poster session on the first night of the symposium. In addition, CDAC Director Russell Hemley gave an invited talk, presenting an overview of CDAC. CDAC Students Pamela Kaercher (Berkeley), Emma Rainey (UCLA), and Dane Tomasino (WSU) all received Best Poster awards during the poster session. This is the third year in a row that Pamela has earned this honor.